In one sense, Hold It Down, with its tangible lists and specifics, feels like an attempt to capture, to grasp: today’s news (which will be replaced by something else tomorrow), a vision of a city that will have changed by morning, the memory of people who’ve gone away, those fragments of an American Dream that still persist, like the promise of starting over, the concept of home. In this sense, it’s a chronicle. 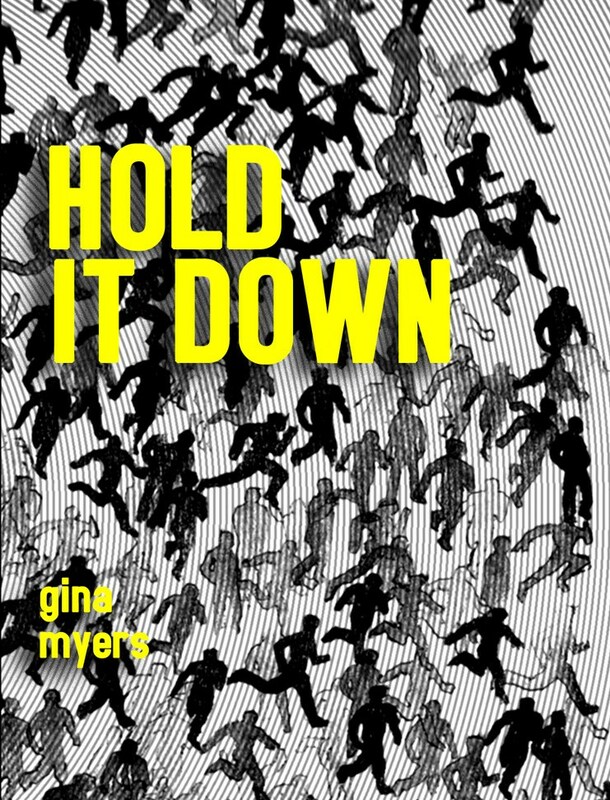 But Hold It Down is also about keeping it together. It’s about maintaining when there are gunshots sounding and “buds suspiciously missing” outside the window. It’s about attending to the immediate—the daily mantra, the single, simple drink—when you don’t know what will happen next week. The personal becomes relatable in Myers skillful hands, and she cracks our hearts when she confirms that one must hold it down in order to go on. 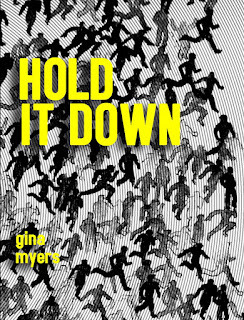 In the first poem of Hold It Down, Myers intimates, “I said it’s easy to write / a poem about something / other than yourself / but still I turn to this.” It’s more confession than promise, one for which this book is all the richer, smarter, damaging. Myers shows us how those things “other than oneself”—the political, the public, the drugstores playing Christmas music, the version of a greedy, faltering America that remains unchanged in a new year—are, indeed, very personal. There’s pleasure in this tension as Myers pushes out beyond the intimate only to return to it. These poems prick the hairs on your neck because Myers returns to the “I”, not in spite of it. Sparkling and devastating, casual and disarming, this book teeters on edges, blurs borders (language, beliefs, geographies), and juxtaposes the surprising with the plainspoken. It’s a book where a “sick gray fog clouding / the radio this morning” brushes up against smudged bus windows. The poem “Static” opens with the declaration, “I am tired of this accidental ghost”, and this book is, indeed, haunted and haunting, with a longing for a missing other that feels at once achingly actual and ethereal. Many lines meditate on the mundane, yet these, too, echo elegiac. When, in “Morning Poem” the speaker claims that she’s not optimistic ”but content here with this cup / of coffee & the enormity of the future”, we believe her, but also sense that tomorrow could be different, that this might suddenly change forever. Myers' poems evoke not only personal grief and longing (for people, for a sliver of surety in teetering times) but also mourning connected to place. These pieces attempt to make sense of an estrangement from American ideals, to decipher what making a life today even looks like. This is an America that doesn’t know what to do with itself, let alone a single, solitary “I” “stretching things thin” between paychecks, with “friends displaced”, and living in a state the news has declared as “dead”. Shopping for a wedding present at Bed Bath & Beyond, the speaker glimpses household items she knows would be the “first to go” when she leaves. The open road holds promise, but it also feels wild in its loneliness—and inevitable. At the center of the book is the sprawling “False Spring”, a poem that, over the course of twenty-seven pages, catalogs surprising and intuitively connected observations and images. Myers generates an escalating friction between contradictions: spring is a sham while the speaker is “April’s fool”, the stories of her particular world could take place anywhere, and the “you” from whom the speaker is separated by miles has more of a presence than absence. Here Myers' language is especially unadorned and urgent, interrogating complexities without flinching or falling sentimental. The speaker tells the truth about grief in elegant, startling ways: “There’s nothing that says this has to end, / but everything ends…”. Yet, “true spring” is on the horizon. Purchase Hold It Down HERE.